Aaah Sundays! Time for fun festivities, lazy afternoons with family, cozy events with friends - everything you need to relax the stress of the week away. Today I am inhaling the beauty of a quiet Sunday in, cleansing my mind, reducing all stress. Taking my time to relax today equals enjoying the luxury of my favorite reading, arranging some candles around the living room and placing a glass of wine or a cup of tea within reach. 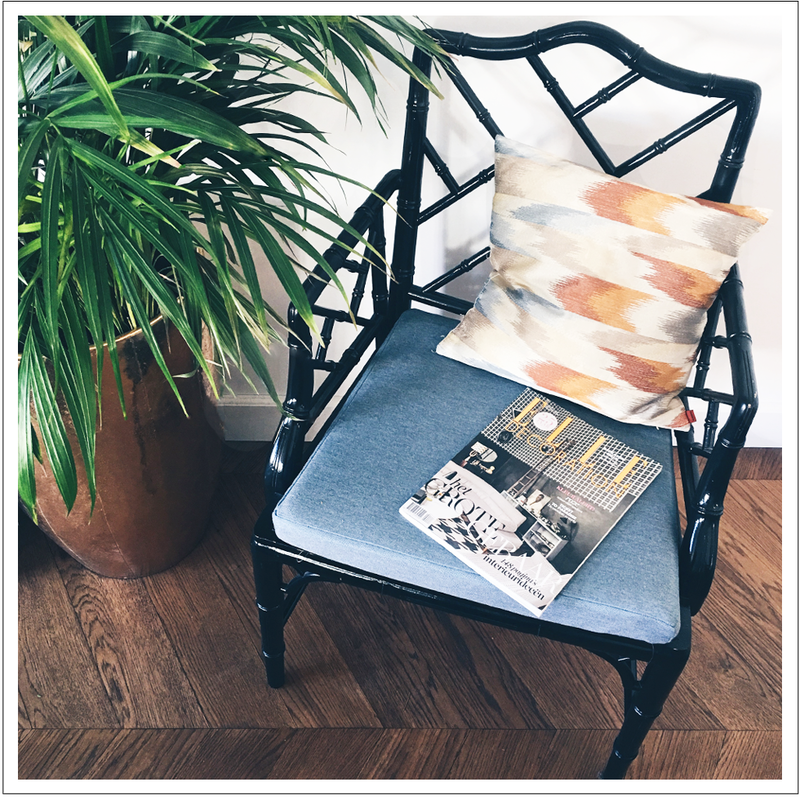 My personal low-maintenance relaxing area contains one very affordable second hand rattan chair, a made to measure custom cushion by nofruit.be, a fresh green touch, my favorite magazine at my fingertips,... you all know where to find me! I have mentioned nofruit.be as my ultimate cherry on the cake interior service before; when looking for custom designed cushions it is the easiest thing to do and the result is simply smashing. After selecting your type of furniture, the shape you need, your favorite fabric and one of the three different filling types you only have to add the dimensions of your choice. Et voila, only two weeks later your custom cushions arrive at your doorstep. Couldn't be easier! Tip! Order some samples first; they have the most beautiful fabrics in store for your cushions and pillows, you'll be amazed when receiving them in your mailbox.